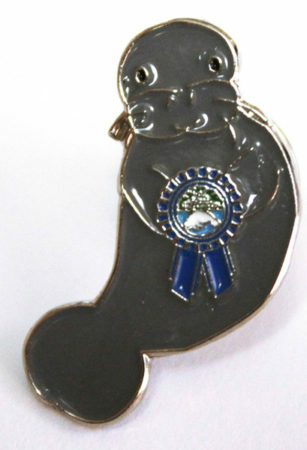 You’ll find the Carrolls educating residents about manatees at numerous Brevard County events. The story of Brevard volunteers Tamara and Tim Carroll is a bighearted one. 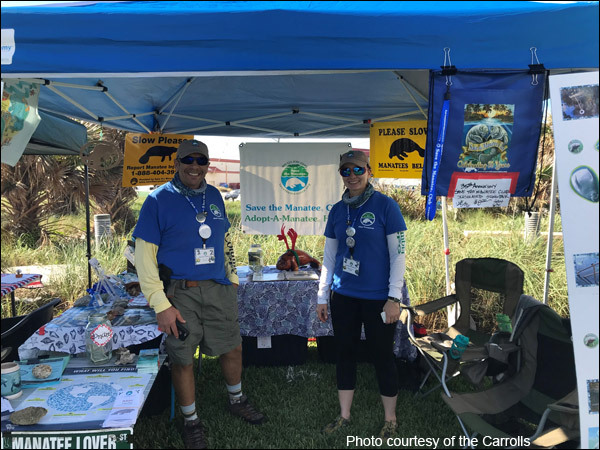 Joining Save the Manatee Club’s volunteer team in early 2015, the Carrolls enjoy actively seeking events in their community where they staff education booths for the Club or give manatee presentations for groups and schools. Tim and Tamara were both presented recently with a special Volunteer Rewards recognition pin for outstanding volunteer participation. At Tamara and Tim’s booth, with the colorful, informative display that they created themselves, local residents see photos of living manatees and learn about the daily dangers they face. A monofilament fishing line recycling tube is part of their display – a reminder how entanglement can seriously injure manatees and other wildlife. The Carrolls enthusiastically greet visitors at their booth, pleased to answer any questions while providing them with a variety of the Club’s brochures, fact sheets, and other awareness handouts. It’s not uncommon to see the Carolls volunteering a few times each month during the fall, winter and spring, and they often handle two or three-day festivals, just the two of them. The Carrolls have a very deep love of the earth, the environment, and animals. Their many interests include road trips, birding, nature viewing, hiking, snorkeling, kayaking, and visits to state parks. Also volunteering with Keep Brevard Beautiful, they participate in roadside, waterway, spoil island, and trash bash clean-ups. They’ve maintained their own “Adopt-A-Road” since 2009.